A photo-illustration of Mario Balotelli depicted as King Kong appeared in Italian sports newspaper La Gazzetta dello Sport prior to Italy's Euro 2012 quarter-finals against England. In a cartoon that ran on Sunday morning, the Manchester City striker could clearly be seen hanging on Big Ben swatting away footballs. 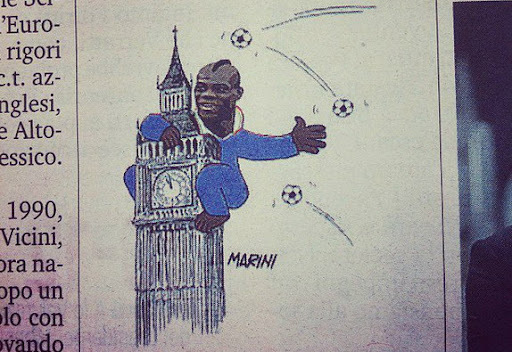 Although the message seemed to be that Balotelli would destroy England, the execution was clearly done in poor taste. Quite how anyone could decide to compare a black footballer to an oversized gorilla is beyond comprehension. Before the tournament kicked off, Balotelli expressed his fears about anticipated racism in Ukraine and Poland, the co-hosts for the European Championships. "Let's see what happens at the Euro. I hope that there will not be a problem," he told France Football. "Because I really can't handle that." "I cannot bear racism, it's unacceptable for me. If it had happened again I would straight away leave the pitch and go home. We are in 2012. It can't happen."